This is our 22"W x 28"L laundry bags which are made of polyester material and feature a draw cord and lock closure and 2 metal hanging grommets. 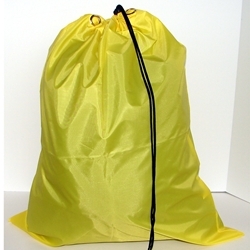 This yellow commercial grade laundry bag is also known as a counter bag. It will complement any home or commercial laundry room. It is durable and will provide years of use at home, in the dorms, or at your facility.